An advanced version of this course is also available. Both the courses may be bought together or separately for $129.99 each. About the ExpertRating Online Supervision and Management Course(Fundamentals) instructor : Patricia Addesso has worked for over 20 years in retail, academic and telecommunications organizations. She has a doctorate in Industrial/Organizational Psychology, and well-grounded in the theory of human behavior at work. In addition, she has held management positions in three companies, and thus "speaks the language" of upper management. This blend of the theoretical and the practical is the hallmark of her consulting style. Dr. Addesso's specialty is organization development and team building. She has been involved in managing mergers, acquisitions, and other large-scale organizational changes, and is currently involved in projects such as strategic planning and personality assessments. Fundamentals of Supervision and Management Course requirements: For taking this instructor led ExpertRating Online Supervision and Management Course(Fundamentals) you need Internet access, e-mail, and the Microsoft Internet Explorer or Mozilla Firefox Web browser. "Thank you. I enjoyed the course. It has already been beneficial to me." "I really enjoyed this class and I printed out all my lessons and supplementary material. It really help to have something to refer back to. Please continue to offer these type of classes. I will get enrolled in others. They were great and convenient for a wife, full time employee, and mother of 3." "Great learning experience -will use in my daily supervisor role." "A great course and very well presented. The topics covered were very interesting and extremely helpful. I have greatly benefited form this course and look forward to taking the next level. Thank you." "My questions were answered in a most timely manner. I enjoyed taking this course and I know it will enhance my career." "It’s not too soon to bring an apple to the teacher, is it? Seriously, I really enjoyed this course. Your scenarios are clearly and interestingly presented and pertinent to real-world settings. Although I’m not in retail (economic development), I can easily see how the dialogue you’ve set up will apply to my situation. I can also see how I may have dropped the ball in certain situations and created more work for myself than was necessary. Properly managed, the circumstance might have had a different, more favorable outcome. Next time, I’ll know better! One more thing…your quizzes are cracking me up! Cheers!" "I liked the personal examples of the instructor that were included. It made it very helpful to hear about real examples. 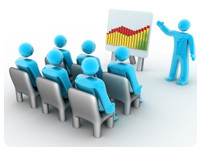 I am recommending this course to my boss and will be taking part 2." "I've been involved in project engineering for a couple of years now. This course was able to structure the things that I'm dealing with on a day to day basis in an educational form for me. It will be of good help for my current job as well as for future jobs in higher management. Thanks and I'm looking forward to Fundamentals of Supervision and Management II." "I really enjoy this courses and I'm already taking the 2nd part. The instructor is great and course content is awesome!" "My first management course. I was able to identify traits, behaviors, etc. in my immediate manager during the course; as well as traits, methodologies of my company. Very enlightening." "I am lucky right now because my manager has been a mentor for me. He is ready to retire and not looking to move up in the company, so he has really taught me a lot of things that I have read in this class so far. It is funny as I read through the course how much of this we have discussed. This course has been some of the best reading I have done in a while." "Taking this course was the best decision of my professional career! I found that I was able to apply the lessons almost immediately to my work life. I also found myself paying more attention to my interaction with my family members. I'm glad I registered for the second part of this course. I can't wait for it to start." "Thank you Patricia! I really got a lot from this class. This was the best online class I have ever taken!" ExpertRating is one of the world's only ISO 9001:2015 Certified companies (from TUV America) offering an Online Supervision and Management (Fundamentals) Course (leading to ExpertRating Supervision and Management (Fundamentals) Skills Certification). When you choose the ExpertRating Online Supervision and Management Course(Fundamentals) you can be sure that you are buying a premium International certification that is recognized by hundreds of employers and Government bodies in the US and other countries. With ExpertRating you get certified quickly online and you are equipped with a store house of information through the in-depth ExpertRating Online Supervision and Management Course(Fundamentals)courseware which has been developed by experienced Business Managers. The ExpertRating Supervision and Management Skills Certification is by far the best value for money instructor led Supervision and Management Training Program at $129.99. How much does the Supervision and Management Training Certification cost and what does it include? You can buy this ExpertRating Online Supervision and Management Course(Fundamentals) leading to ExpertRating Supervision and Management Training Certification at a special offer price of only $129.99 which includes the in-depth ExpertRating Online Supervision and Management Course(Fundamentals) courseware and exam fee. This is the best value for money Supervision and Management Training Program available till date. You get the following services within the USD $129.99 fee. In-depth ExpertRating Online Supervision and Management Course(Fundamentals)courseware including scenarios and case studies. 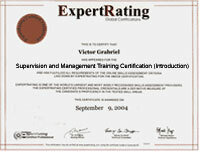 World wide airmail delivery of the hard copy Supervision and Management Training Certificate. The Supervision and Management Training Skills certificate can be used to prove your certified status and does not mention the words "online". The process of getting yourself certified is very simple. All you have to do is buy the ExpertRating Online Supervision and Management Course(Fundamentals) for $129.99. Log in to the instructor led course using your password. Go through the ExpertRating Online Supervision and Management Course(Fundamentals)courseware (which would take you 6 weeks) and complete the final Supervision and Management Training certification exam at your convenience. You can complete the exam within 2 months of buying the Supervision and Management Skills certification. The result of the exam appears as soon as it is completed, and your Supervision and Management Skills certificate is mailed immediately. Chapter assignments to help you practically use the Supervision and Management skills that you will learn during the ExpertRating Online Supervision and Management Course(Fundamentals). The final exam is fully based upon the ExpertRating Online Supervision and Management Course(Fundamentals)courseware that is provided along with the Supervision and Management Skills certification. If you have gone through the courseware properly you should not have a problem clearing the exam. The exam consists of multiple choice questions from all chapters of the ExpertRating Online Supervision and Management Course(Fundamentals)courseware. The highest paid office and administrative support supervisors and managers in the United States earn more than $71,340 annually. According to the U.S. Department of Labor Statistics, the office and administrative support supervisors and managers held 1.4 million jobs in 2006. Office and administrative support supervisors and managers, especially those working in the private sector, can expect perks and benefits in the form of bonuses and stock options. The Managers and supervisors plan, guide and monitor the activities of a work group and take corrective action whenever required. 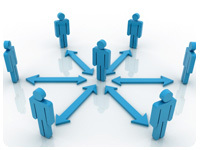 The management can directly manage the workers or hire supervisors under it to carry out the task of managing the workers. A manager’s job title represents the job he carries out. For instance, a Human Resource Manager or Supervisor recruits and trains the employees and also keeps supervision over them. The basic management and supervision function is to help the organization to improve its results, both by increasing employees' performance and improving financial turnover. The basic educational qualification required for a manager or a supervisor is postsecondary training. However, some organizations and job titles may ask for a bachelor’s degree. A prospective supervisor or manager is also expected to possess qualities like handling teams, problem-solving, leadership, strong communication skills and confidence. Enhance your resume with an ExpertRating Online Supervision and Management Skills Certificate. It will definitely give you an edge above the rest. Through this course you would gain the necessary skills and knowledge that will equip you to be a Certified Supervisor or Manager. How has management theory evolved over the last 100 years? This lesson will take a fascinating glimpse back into the days of assembly lines and scientific management. Why did were managers needed in the first place? This lesson will look at the ways organizations are structured and describe managerial jobs in terms of the technical and managerial tasks that are performed. This lesson will focus on identifying the characteristics of a typical supervisor's day, as well as ways of handling the challenges faced during that day. This lesson will talk about ways to make the supervisor’s path smoother, such as empowerment and communication. It will also go over some helpful hints on managing your image as a supervisor in your organization. How does one begin to think, act, and look like a manager? Is leadership distinct from management? Do you have what it takes to be a leader, or are you cut out to be just a manager? This lesson will look at the evolution of leadership research and begin to discuss the fascinating field of motivation. Believe it or not, a good leader can build motivation right into the design of a job. This lesson will look at the ways a supervisor can handle the challenges of delegation, performance management, and time management. If one is able to understand the challenges of a typical day, he/or she can certainly understand why is time management so important to a supervisor! This lesson will identify time-wasters and time-savers. Time to really dig into the topic dear to many managers’ hearts-motivation! This lesson will clarify what managers need to understand about human motivation, and help you to understand the links between motivation and productivity. Motivational theories are great as long as they truly help you to manage people at work every day. This lesson will look closely at four theories that pass that test in this lesson: Maslow’s hierarchy of needs, Herzberg's two-factor theory of motivation, the three levels of human need in Alderfer's theory, and the three needs outlined by McClelland. Do you believe that people naturally want to do a good job? Or are people lazy by nature and need to be watched? In this lesson, find out if you're a Theory X or a Theory Y-type of manager. There self-fulfilling prophecies to each of those beliefs, and this lesson will go over both. This lesson will also discuss goal-setting theory, management by objectives, and the various types of conflict you may meet when motivating people. Lesson 8 will define two more very practical and influential motivational theories; Equity theory and expectancy theory. Then the theoretical discussion will be wrapped up after making sure that the students have understood the importance of creating a motivational environment. Now comes the hard part-when real life doesn't work out the way the theories told us it should. What happens when conflict arises? Today’s lesson will talk about conflict and conflict resolution. It will include specific techniques of negotiation, a particular type of conflict management. Thinking will be broadened a bit in this lesson: Previous lessons had looked more at individuals, but what about conflict and problem-solving in work groups? This lesson will identify means of solving conflict between groups. It will also explain a problem-solving model that is useful in work and in life! This lesson will continue to explore the problem-solving model introduced in Lesson 10 by talking about the importance of establishing objectives, generating alternatives, and choosing a solution. Lesson 12 concludes the problem-solving model by explaining the importance of having a plan of action, and giving you the tools you need to carry the plan through to completion. The lesson will conclude by taking a final look at the conflict that can arise while solving problems and completing action plans, and the appropriate use of power to solve some conflict.